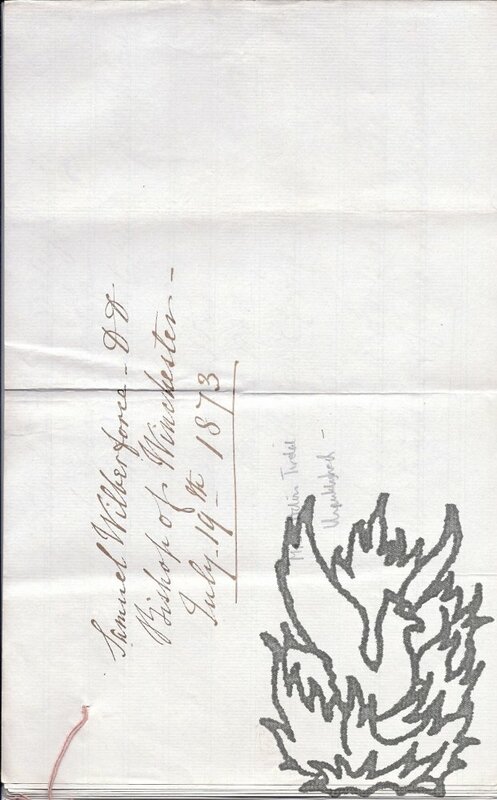 [Parliamentary paper.] Cape of Good Hope: Botanical Collectors. 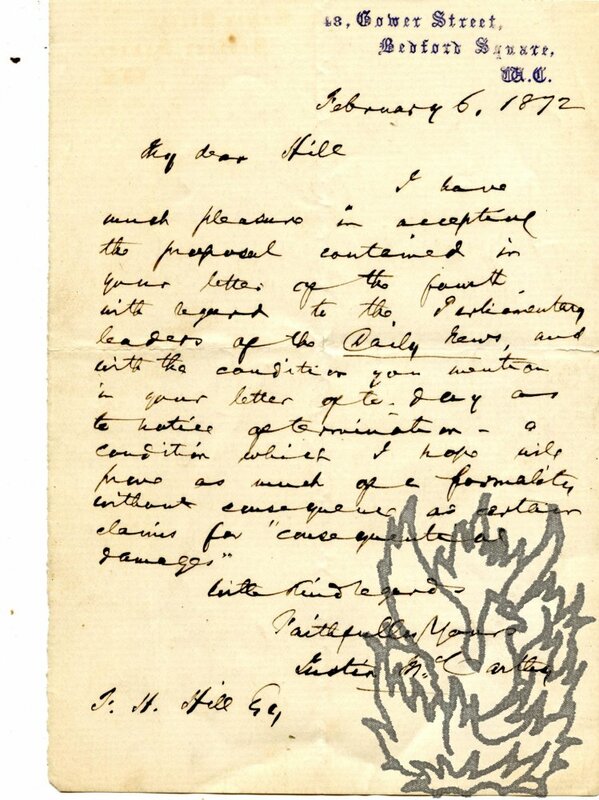 Extract of a Letter dated 1st September 1814, from Sir Joseph Banks to George Harrison, Esquire, recommending the appointment of two Botanical Collectors at The Cape of Good Hope [...]. 3pp., folio, paginated to 3. Bifolium. Disbound. In fair condition, on aged and lightly-creased paper; folded twice into the customary packet, with the title printed lengthwise as usual. [Printed book.] 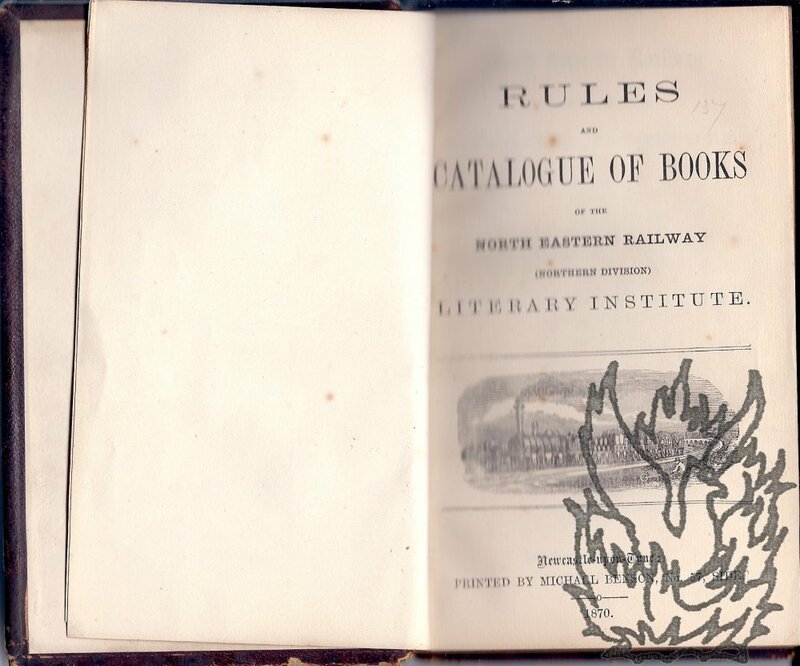 Rules and Catalogue of Books of the North Eastern Railway (Northern Division) Literary Institute [Newcastle-upon-Tyne]. Newcastle-upon-Tyne: Printed by Michael Benson, No. 57, Side. 1870. 12mo, 10 + 67 pp. 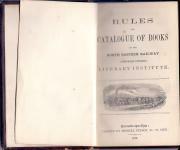 In original purple morroco binding, with 'PRESENTED TO | T. E. HARRISON, ESQ., | VICE-PRESIDENT.' 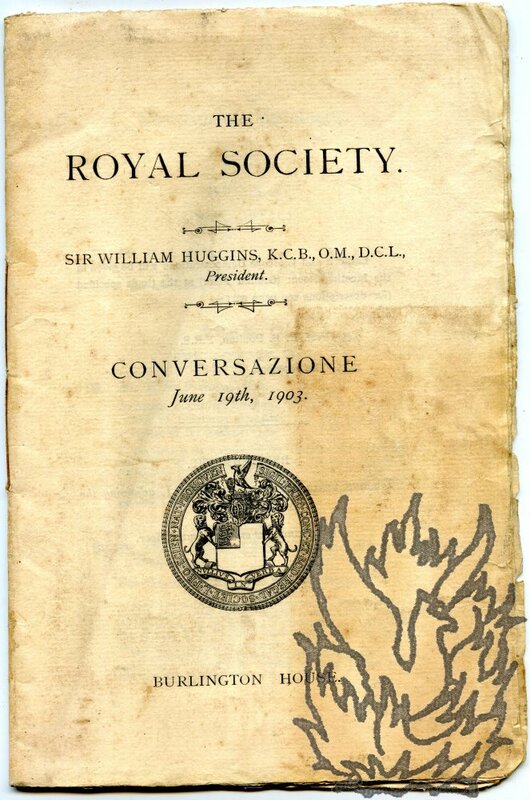 stamped on the front cover in gilt. A tight copy, in fair condition, on aged paper, with front endpapers sprung, and in a worn binding. Vignette woodcut on title-page, showing man working beside track as locomotive goes past. 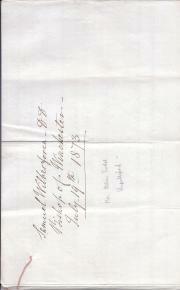 Autograph Letter Signed ('Justin Mc.Carthy') to 'F. H. Hill Esq'. 12mo: 1 p. Fourteen lines of text, neatly and closely written. Good, on lightly aged and creased paper. 1 cm closed tear to a margin (not affecting text). 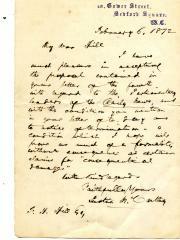 He accepts Hill's proposal 'with regard to the Parliamentary leaders of the Daily News'. He hopes the 'condition [...] as to notice of termination [...] will prove as much of a formality without consequence as certain claims for "consequential damages" '. Coloured engraving entitled 'To the Magistrates Noblemen and Gentlemen of Cheshire this Portrait of Thomas Harrison Esqr to whose Taste the County is indebted for its Principal Architectural Embellishments is inscrbed by their humble Servt A R Burt'. A R Burt | Miniature Painter Chester May 1 1824'. On piece of paper roughly eleven inches by eight wide. 'Col[oure]d 2/6' engraved in bottom right-hand corner above caption. 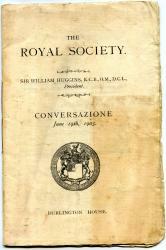 On aged paper, creased and with two closed tears of one and a half inches apiece, and one of half an inch, none of the three affecting the image. Full-length portrait of a somewhat simian Harrison, in black top hat and brown cut away jacket, clutching his arms in front of his belly with one glove removed, standing on a grassy hill (in front of Chester Castle?]. Two small ink docketings on reverse.